Illustrating the "happy slave" myth. Some of the myths (falsehoods) sown by Southern planters—and cultivated from the antebellum period and Reconstruction to Jim Crow—stubbornly cling to some perceptions of this pivotal upheaval in American history. These include the myth of the "happy" slave and the "benevolent" master, and the notion that the Civil War was not fought over slavery, but over states’ rights and secession. These are specious arguments. What states wanted was the right to own slaves! 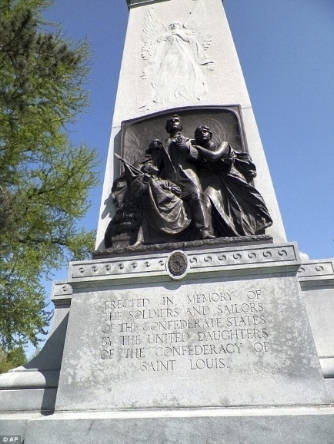 Monument moved from Forest Park in St. Louis to the Missouri Civil War Museum at Jefferson Barracks. Was maintaining racial superiority more important than victory? Historically, on a rare occasion when a black Confederate company was formed and marched through a town, they were hardly met with cheers and roses. Rather, citizens actually threw rocks at them. Black Confederate soldiers never did get into battle, although there was some shooting: more a warning “don’t come this way” than an actual battle. On the other hand, over 100,000 black soldiers and sailors, including many free blacks, did fight for the Union to free their people and to established their full manhood in the country in which they were born. This “principle” is demonstrated in my upcoming Civil War novel, Honor Among Outcasts, the second in my DarkHorse Trilogy (October release). Here, the war is raging, and the DarkHorse men (former partners from Book 1, The Lies That Bind) have joined the Union army to fight Confederate guerrillas in western Missouri. Since “colored” (black) regiments were required to have a (superior) white officer, this role is played ironically by their partner, pacifist/abolitionist/foolhardy Durksen Hurst. Note: An important element of the DarkHorse Trilogy, and my most personally compelling reason for writing it, is to debunk these hurtful falsehoods by showing the values, hopes, fears, ambitions—and flaws—we all share as human beings, and our equal right as Americans, white and black, to life, liberty and the pursuit of happiness. Get news about the release of Honor Among Outcasts. Subscribe to Ed's email list now!